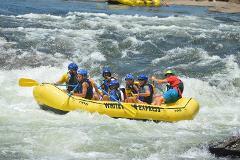 Our most popular rafting trip - Departs from our Phenix City, AL Location. Trips are typically run at 10:00 AM, 12:00 PM, 2:00 PM Eastern daily. 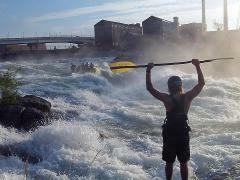 Our most popular rafting trip - Departs from our Columbus, GA location. This trip typically runs at 9:00 AM, 11:00 AM, 1:00 PM, and 3:00 PM Eastern daily. Test your meddle in an inflatable canoe! This trip departs from our Columbus, GA location. 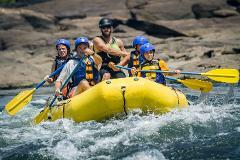 The milder version of our popular Classic rafting trip - Departs from our Phenix City, AL Location. This trip typically runs at 10:00 AM, 12:00 PM, and 2:00 PM Eastern daily. The milder version of our popular Classic rafting trip - Departs from our Columbus, GA Location. This trip typically runs at 9:00 AM, 11:00 AM, 1:00 PM, and 3:00 PM Eastern daily. 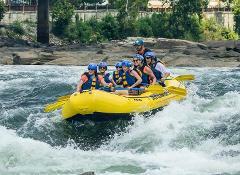 Our Season Pass gives you unlimited access to Classic and Challenge rafting trips on the Chattahoochee River. Additionally, passes allow unlimited use of the Blue Heron Zip Line. This pass is valid one year from the date of purchase..